Robin Hood shirt with attached shoulder sash, pants with attached boot tops, hat and waist sash. Hand wash.Do not use bleach. 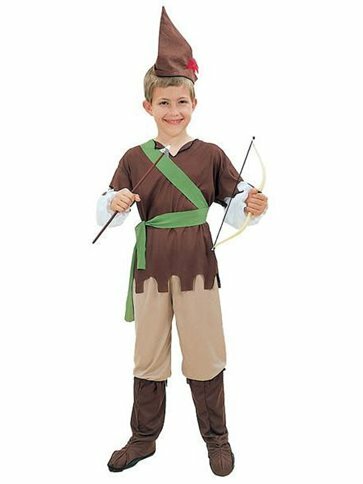 This Robin Hood costume features a long sleeved top with elasticated cuffs, attached green shoulder sash and jagged finish. A pair of trousers with elasticated waist and attached boot covers with elastic under foot to secure in place. To complete this classic character costume, also included is a co-ordinating, green, velcro fastening waist sash and Robin Hood style hat with red side feather. Want it Friday, 26 April? Order it within 16hrs and 5mins and choose Premium by 9pm Delivery at checkout.